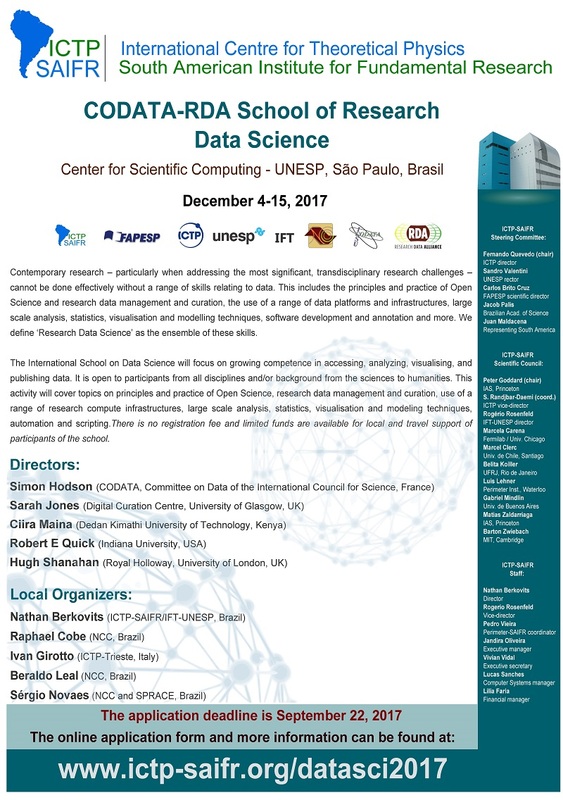 Applications are invited to participate in the CODATA-RDA School of Research Data Science which will be held at ICTP-SAIFR, São Paulo, Brazil, 4-15 December 2017. The deadline for applications is 22 September 2017. Springer Nature also provides a free-to-use Research Data Support Helpdesk, which anyone can contact to get advice on research data – from which repository is best for your data, to how to write a data availability statement, to questions about licences for sharing data. Applicants from any region are strongly encouraged to look for alternative sources of funding to support their participation. For the recent CODATA-RDA School of Research Data Science in Trieste <link> a large number of students were able to support their participation with funding from a variety of sources including their institutions, various grants, charities and sponsoring organisations etc. What can justly be called the ‘Data Revolution’ offers many opportunities coupled with significant challenges. High among the latter is the need to develop the necessary data professions and data skills. Researchers and research institutions worldwide recognise the need to promote data skills and we see short courses, continuing professional development and MOOCs providing training in data science and research data management. The CODATA-RDA School of Research Data Science has developed a short course, summer school, style curriculum that addresses these training requirements. The course partners Software Carpentry (using the Shell command line and GitHub), Data Carpentry (using R and SQL) and the Digital Curation Centre (research data management and data management plans) and builds on materials developed by these organisations. Also included in the programme are modules on Open Science, ethics, visualisation, machine learning (recommender systems and artificial neural networks) and research computational infrastructures. The school has been successfully piloted at ICTP in Trieste in 2016 and 2017. The vision of the CODATA-RDA Schools of Research Data Science is to develop into an international network which makes it easy for partner organisations and institutions to run the schools in a variety of locations. The annual event at the ICTP in Trieste will serve as a motor for building the network and building expertise and familiarity with the initiative’s mission and objectives. The core materials are made available for reuse and the co-chairs and Working Group team will provide guidance to assist partners in organising the school, in identifying instructors and helpers etc. The first school to expand this initiative will take place at ICTP-SAIFR (South American Institute of Fundamental Research), São Paulo, Brazil in December 2017.